Trimpin premieres The Gurs Zyklus at Stanford University’s Memorial Auditorium on May 9, 2011 as part of Stanford Lively Arts’ 2010-11 Season. The Gurs Zyklus (Gurs Cycle) is a performance that combines instrumental and vocal music, sculpture, and spoken word. In some ways, it is a culmination of many aspects of Trimpin’s career and personal biography, drawing together elements of his childhood in Germany, his artistic practice as an instrument-maker and the history of the internment camp at Gurs, near the Spanish-French border. Born in Istein, Germany (now Efringen-Kirchen) in 1951, Trimpin was haunted by the camp at Gurs, where Jews from Istein were interned during World War II. As an adult, he worked with composer Conlon Nancarrow, who revealed that he had been held at Gurs during the Spanish Civil War. After mentioning Gurs in a 2006 profile in The New Yorker, Trimpin was contacted by Victor Rosenberg, who offered Trimpin more than 200 of his family’s letters mailed from the camp to use in his artistic practice. These letters and other elements, united by history, profound coincidence and the power of Trimpin’s imagination, weave together The Gurs Zyklus: vocalists sing and recite texts drawn from the Rosenberg letters into “fire organs” of Trimpin’s invention. The work also features a water harp and “musical teeter-totter” by Trimpin. Projections of images from Gurs meld with film from Trimpin’s own retracing of the journey by train to the camp. Nancarrow’s compositions meet sounds Trimpin derived from bark patterns of the trees near Gurs—among the last living “witnesses” to the camp’s dark history. The Gurs Zyklus offers a new perspective on an important story now at the edges of living memory, as well as a stage experience that is immersive and deeply moving. 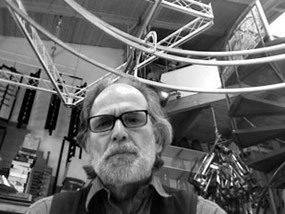 Trimpin is a German-born composer and sound artist who has lived and worked in Seattle since 1979. His sound sculptures, installations and set designs have been commissioned by artists as diverse as Merce Cunningham, Samuel Beckett and the Kronos Quartet. These works have been exhibited locally, nationally and internationally at spaces including the Yerba Buena Center in San Francisco, Circulo De Bellas Artes in Madrid and the LOGOS Foundation in Ghent. Trimpin’s awards include the MacArthur Foundation’s “Genius Award” and a Guggenheim Fellowship, as well as residencies at numerous art centers, universities and colonies. The Gurs Zyklus was made possible with a grant from Creative Capital, a national nonprofit organization dedicated to providing integrated financial and advisory support to artists pursuing adventurous projects.